Well, let this be my very first lesson – that like human babies, garden babies have a mind and time frame all on their own. 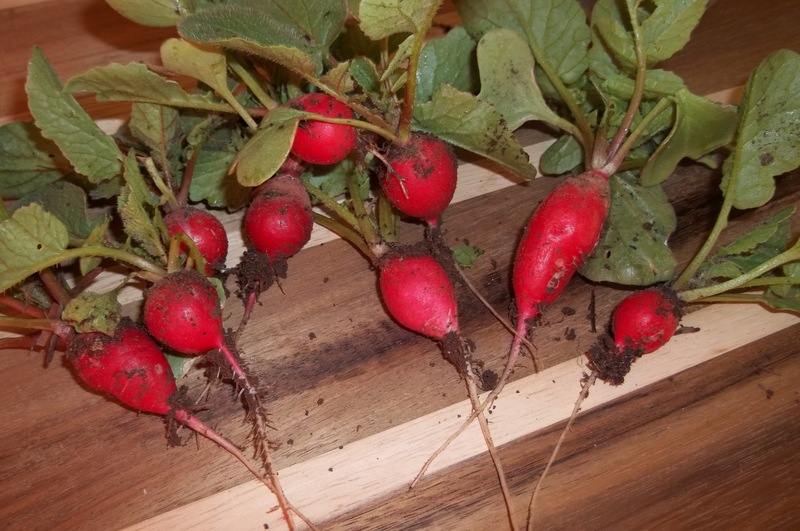 Sunday I was thinking I would need to wait until later in the week to harvest my first radishes, and then BAM! went out before work to find I had an entire bowl full ready to be plucked from the ground. I dusted a little dirt carefully away from their tops (for those that I could see the little red bulb and whose leaves had started to turn a bit purple) and grabbed the entire leaf stalk and gentle wiggled them from their cozy beds. I still have several that aren’t quite there yet, but at least for tonight – we’ll have some fresh garden salads. I’ll pick a little lettuce and spinach tonight before dinner to really round out our meal. Our first radish harvest!! A great first time gardener ego boost!!! One thing I noticed – there were a few that suffered from over crowding (thus the not so round feature). While I’ve been doing a diligent job of thinning, there were still a few that were simply missed. I’ve already made my documentation in my garden journal regarding planting my next batch so this can be avoided. If I work quickly enough in the next few nights, I just might be able to get in one last planting of radishes. According to Oklahoma State Univeristy’s Co-Op Extension Service, April 15 should be the very latest that they’re planted…we’ll try for one last experiment and better spacing. I have an empty 2×2 space where I could plant them!! So excited to try one more round. YaY!!!! They look yummy!!! My daddy would wipe those babies off, put salt and pepper on…then pop them in his mouth!!! I was very careful with my carrots this year as not to overcrowd them, but I do love how adaptable root veggies are to their given space. You can put rocks underneath them, and they’ll just split in two and grow on either side! After another harvest this evening of the radishes, I realized I hadn’t thinned them as well as I had originally thought. It sparked me to do a good run through thinning job of my carrots!!! While I didn’t mind oddly shaped radishes, I’d at least like to have it a goal to have normally shaped carrots. It’s all a learning experience this year!